Spring may have officially started, but high snow banks and cold temperatures aren’t budging up here. Six rows of stacked firewood have shrunk to a quarter row. The chickens are huffy and skimp on eggs, the dogs chase the cats who chase each other. And yet! Shoveling gets the blood going, the onion seeds we planted in February are now sturdy green shoots two inches tall, sap is running (well, some sap is running) and Michael Hoy Woodworking is in its 25th year. Permanence and renewal proceed hand in hand. Winter is bound to give way! 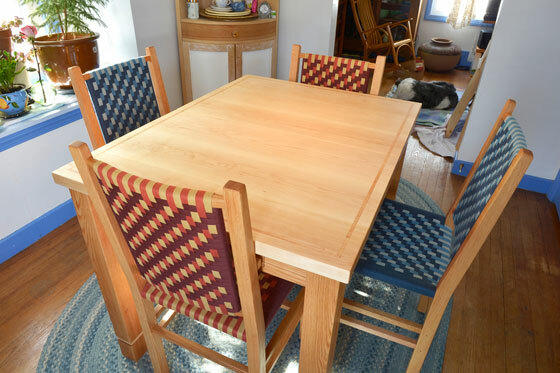 We recently finished a table and four chairs for Nan and Paul, a couple we met at the Northampton Paradise City Show last October. 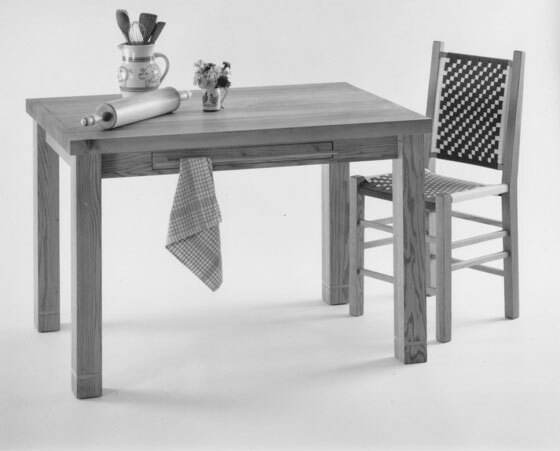 The table design is an adaptation of our original rectangular kitchen table design, now 25 years old. The essence of the original table remains--the industrial scale, heavy legs, thick maple top, square stock. At the show Nan and Paul tried out the chairs, sat at the table, checked leg room, Nan “air” kneaded dough on the top to test height, and we discussed their space constraints. Nan and Paul loved this table but needed it to fit a small space. We thought about smaller dimensions, but what about when visitors come? The conversation continued via email and telephone--how to adapt the original design to an extension table without losing its “work table” feel? 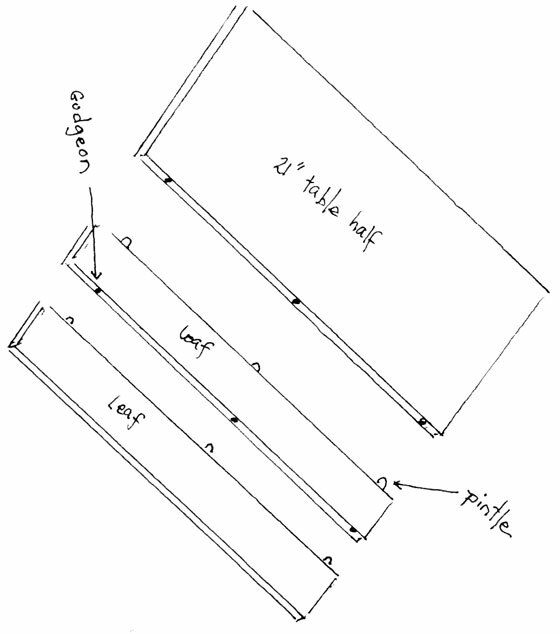 How to fit 2 drawers with the extension apparatus? 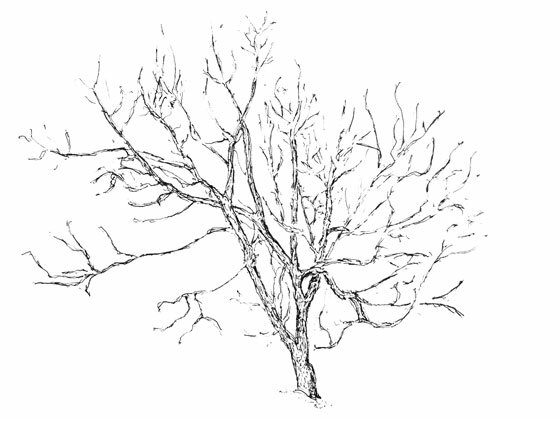 How many leaves and what size? Then other concerns: wood species, colors for chair tapes, heights, widths, etc. Collaborating with customers is an integral part of our process and always enjoyable. The final design is a 42” x 32” x 32” red oak rectangular extension table with a 1 ½” maple top, two drawers, one at either end of the table, small enough to fit between the slide hardware underneath but still large enough to be of use, and two 10” leaves. With both leaves in place the table becomes 62” long. The leaves are cut from the same maple stock as the top. 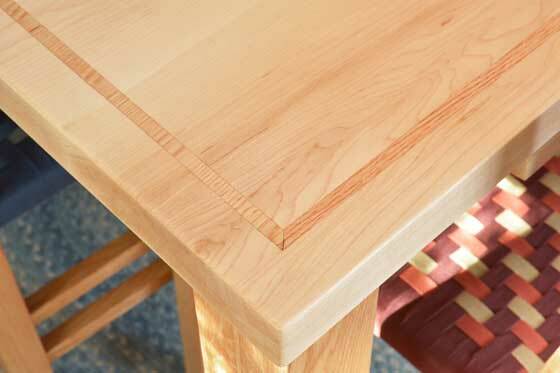 The inlay on the leaves conforms with the table inlay. 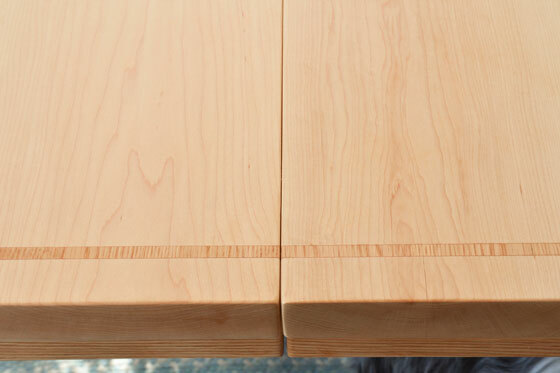 Wood pintles (small rounded pins) fit into gudgeons (matching holes) and align the two halves of the table and the leaves together on a single plane. The extension hardware underneath, hidden by the table skirt, has two parts. 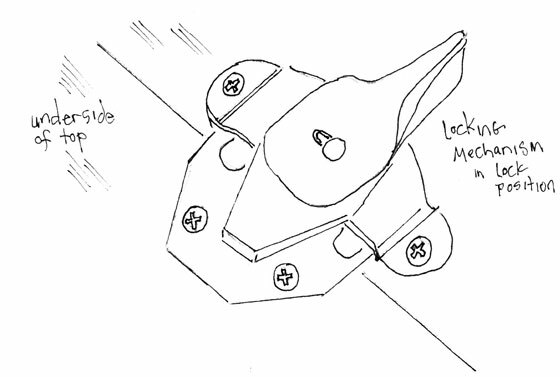 1) the locking mechanism - once pintles are in gudgeons, this mechanism locks the two halves and the leaves together for a rock solid surface. 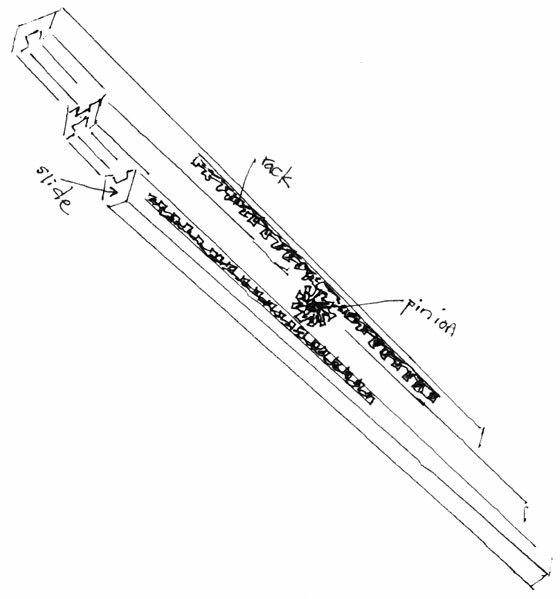 2) slides - these are made of wood with metal rack and pinion gearing and allow the table to open for the leaves, keeping the halves parallel and properly aligned. The chairs are red oak, matching the table base. Two are taped in reddish hues--cranberry, rust and raffia--and two are taped in blue hues--blue, teal and slate. 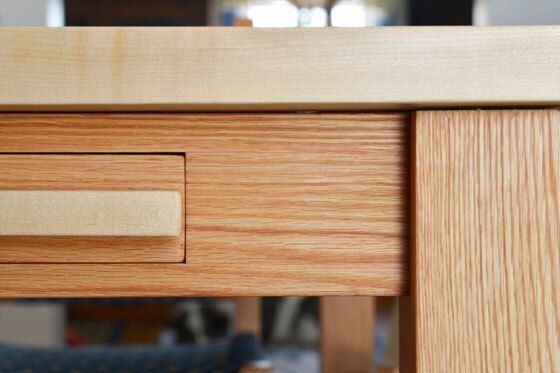 The use of three colors per chair adds complexity and zing and highlights a serene maple top. As with all our tables and chairs, the finish is a mix of linseed and tung oil, followed by paste wax. The two oils penetrate the wood, protect it and bring out a rich patina. Linseed oil is pressed from flax seed and tung oil from the nuts of the tung tree. The paste wax further protects and adds luster to the patina. This is a traditional finish, a technique used for hundreds of years. It can be renewed whenever necessary, even in another hundred years! It was a distinct pleasure working with Nan and Paul. Many thanks to Paul, a professional photographer, for letting us use the above color photographs. Go to https://paul-marotta.squarespace.com/ to see more of his work. It was also a distinct pleasure, in our 25th year, to be continuing with original designs and stretching them in new directions. Renewal! Nan and Paul’s dog Mac using footrest for pillow. Seal of approval! Our next show is coming up, April 4—6 in Philadelphia at the 23rd Street Armory. We hope to see you there and hope to get a glimpse of spring there too!